Los Angeles forward Alan Gordon’s goal in the 75th minute evened the score in a hard-fought 1-1 draw against Colorado Saturday night at the StubHub Center. 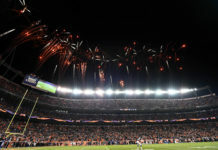 Both teams were coming off 1-1 draws against New York, but the defending MLS Cup champions came into the match with additional four days rest with Colorado playing their previous match on Wednesday night. But the visitors (1-2-6) struck first in the 40th minute, scoring on the counter-attack when Michael Harrington sent a pass into open space for Gaby Torres to chase. Torres beat two defenders to the ball, attacked the goal alone and shot it past Galaxy goalkeeper and fellow Panamanian Jaime Penedo for his fourth goal of the season. Los Angeles (3-2-4) struggled with Colorado’s high-pressing offense for much of the match and created few chances during the run of play, but Galaxy head coach Bruce Arena made multiple second half changes, including sending Gordon on as a substitute in the 72nd minute. This decision paid off. Gordon got on the end of a Stefan Ishizaki corner kick in the 75th minute and headed it down and into the bottom right corner of the net, past goalkeeper Clint Irwin to even the score at 1-1. “Good goal. Alan certainly knows how to come into a game, and that’s a real skill. He continues to do it, so I give him a lot of credit,” manager Bruce Arena said of Gordon’s goal. Both teams pressed hard in the final 15 minutes and neither team found the late winner even with five minutes of added time. 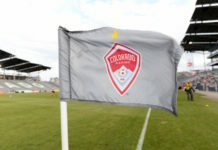 Midfielder Sam Cronin, donning the armband for Colorado, appeared to put the Rapids in front again in the 82nd minute, but the play was ruled null on an earlier offsides call against Lucas Pittinari. 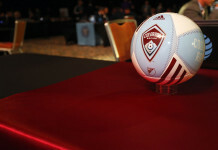 Colorado returns home Friday night as they welcome in the San Jose Earthquakes at 8pm. You can catch that game on Mile High Sports Radio AM 1550| FM 94.1|96.9 in Boulder.